Flights between Newquay and Gatwick are to end after Easyjet said it would not run the service next year. The move will end the far south west’s only year-round air link to London. Easyjet, which has blamed insufficient demand, took over the Gatwick slots from Flybe, but will now run summer-only flights to London Southend. Newquay Liberal Democrat MP Stephen Gilberttweeted that he was “gutted” and it would be a “blow to businesses across Cornwall”. In a statement, the firm said: “Following Flybe’s decision to cease operating from London Gatwick to Newquay, Easyjet carefully and thoroughly examined the commercial viability of offering year-round services on the route. It said newly announced routes to London Southend and Liverpool will “fly thousands of people into the region providing vital support for the local economy over the summer peak”. But one businessman, Chris Ingram from Cornwall-based Continental Underfloor Heating, said he was “pretty devastated” about Easyjet’s decision. The Newquay-Gatwick route has been regarded as a regional economic lifeline, especially since flights to and from Plymouth Airport stopped in July 2011. 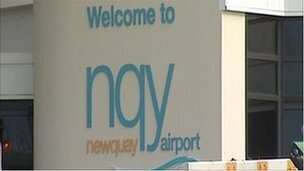 Cornwall Council, which owns Newquay Airport, said it was “disappointed” that the Gatwick route would end. The airline plans to operate four flights per week to and from London Southend from 14 July until 7 September 2014. The airline will also fly two services per week between Newquay and Liverpool starting on 3 July until 7 September 2014.